Corals employ two fundamentally different modes of reproduction. Sexual reproduction involves coral gametes (i.e., eggs and sperm) being liberated or ‘spawned’ into the water column that come together and create genetically unique coral colonies. Asexual reproduction includes the creation of coral colonies that are genetically identical (or ‘clones’). This occurs though fragmentation, where pieces of a coral colony break off and grow into new colonies, or budding, where a coral polyp splits into two identical polyps. Budding is the process allowing coral colonies to grow larger. Active propagation efforts can employ both of these modes, with differing costs and benefits. Successful reproduction and recruitment of new corals with diverse traits are essential for restoring coral populations. If coral populations are low, limited recruitment can significantly inhibit coral reef recovery even with other management actions in place. This section describes the steps involved with restoring coral populations through larval propagation methods utilizing the sexual reproduction process. 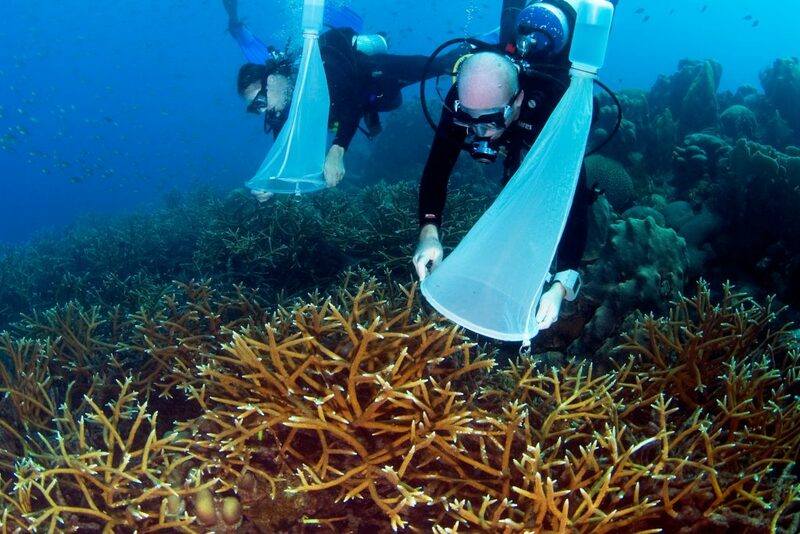 The most important benefits of utilizing sexual reproduction for coral restoration is the ability to dramatically scale up the number of coral outplants, work with numerous coral species and morphologies, and increase the genetic diversity of corals on reefs. Although mass coral spawning events occur only 1-3 times per year, these events can provide millions of baby corals – each of which represents a new genetic individual. Of course, there are also challenges to larval propagation techniques. For instance, most coral spawning events occur at night, coral larvae are microscopically small and vulnerable, and larvae have specific ecological requirements for successful settlement and metamorphosis. Thus, considerable experience and preparation are required to tackle these restoration techniques and further hands-on learning with experts is encouraged.